I believe one of the things the XY Base Set will be known for as the game progresses into the future is the number of strong Stage 1 cards featured in the set. XY in itself is an amazing set, with strong EX’s (Xerneas EX and Yveltal EX), good Stage 2’s (Delphox and Greninja) and for purposes of this article, a lot of good Stage 1 Pokemon, and I mean a lot. Just off an initial scan of the set, Trevenant, Gourgeist, Raichu, Dugtrio, Aromatisse, Slurpuff, Swellow, and Diggersby all have competitive potential. That’s a total of 8 Stage 1’s that could be impacting our format. Why is this important? Because Stage 1’s are relatively easy to setup, and generaly come with more energy efficient attacks than non-EX Basic Pokemon and strong Abilities that just aren’t found on these Basic Pokemon. Additionally, Abilities previously reserved for Stage 2’s and EX’s have found there way onto the new set of Stage 1 Pokemon. In this article, I want to mainly look at Gourgeist, which is a Pokemon that I think is one of the most interesting in the new set. As far as base stats go, they’re pretty standard for a Stage 1 Pokemon. It is a 100 HP Psychic Type Pokemon. It has a two retreat cost, a Dark weakness, and a Fighting resistance. It has two attacks. 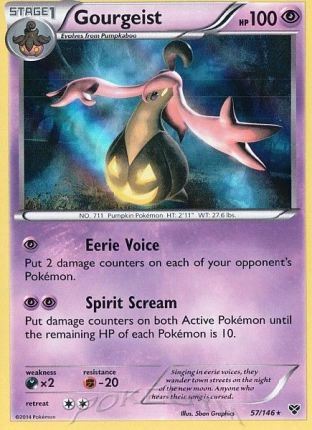 The first, Eerie Voice costs [P] and says put 2 damage counters on each of your opponent’s Pokemon. The second attack, Spirit Scream costs [P][P] and says place damage counters on both Active Pokemon until they each have 10 HP left. What has me most excited for Gourgeist is its potential as a spread attacker. Since Mr. Mime came out, spread strategies haven’t really been able to play themselves out as Mr. Mime’s Barrier Block prevents bench damage from attacks. The neat thing about Gourgeist is that it is placing damage counters and not doing attack damage, a neat rule intricacy of the game that allows you to get around Mr. Mime’s Ability and still get the damage on the defending Pokemon. It’s second attack has some potential for OHKO if played in conjunction with Hypnotoxic Laser. 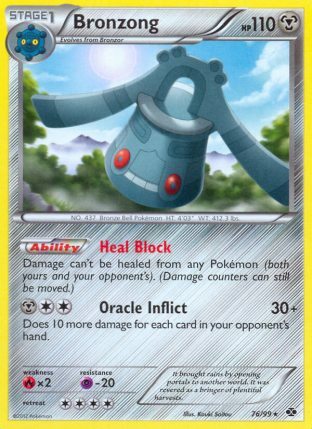 Additionally, it can just be used to amass massive damage on a Pokemon that can be finished off later with another spread attack or to be used with Dusknoir’s Sinister Hand Ability. Today I’m going to look at three different decks that I’ve built using our ghostly pumpkin friend. This is basically a new age Flareon deck, incorporating new Pokemon from XY to strengthen the deck. How do I use Gourgeist in this deck? I use it mainly for Eerie Voice to spread damage around to soften up my opponent’s Pokemon for my other attackers. This really helps soften the damage numbers that Raichu and Flareon need to hit, and lessens your need to hit a Silver Bangle or Muscle Band when countering something for weakness. I have used Spirit Scream in some spot situations when the cards aligned properly. I’m not really sure if the thick Gourgeist line is necessary or not. I think the deck could potentially be stronger by cutting down the line to a 2-2 and adding a fourth Eevee and a third Flareon to the deck. 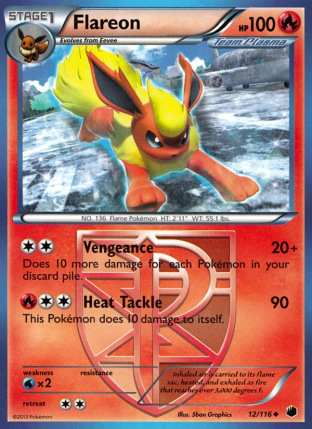 Flareon – This is a great counter to Virizion/Genesect decks, as it hits it for weakness. With just 4 Pokemon in the discard pile, you can start OHKO’ing Virizion EX and Genesect EX with Vengeance. It is also your sweeper and generally good attacker in all matchups, as the game dwindles down and more Pokemon hit your discard pile, Vengeance should be lifting to damage numbers that OHKO anything in the game. Leafeon – This is obviously a counter to Blastoise decks to prevent them from just loading up a Keldeo EX and sweeping through all of your Pokemon with Secret Sword. It also can be fairly strong against Fairy decks when they get a lot of Energy onto their field. Energy Crush in combination with Silver Bangle or Muscle Band after some Eerie Voice’s can do quite well in OHKO’ing the attackers in Fairy decks. Raichu – Quick and easy counter to both Yveltal EX and Lugia EX. 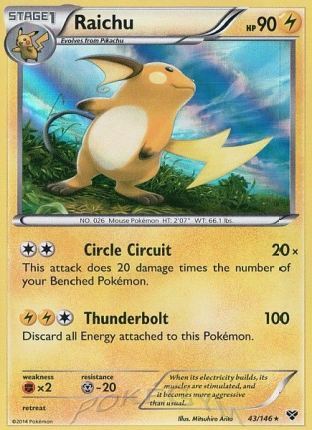 Circle Circuit does 20 damage times the number of benched Pokemon you have, so with a full bench, you can hit for 100 with it. It’s also a strong attack to use in the mid game against non-EX Pokemon, as it does 120 with a Muscle Band, which is usually enough after some Eerie Voice attacks. Dugtrio – This is your counter to Darkrai EX and Thundurus EX, being able to OHKO both with a Silver Bangle for just one Fighting Energy. Mewtwo EX – As the deck relies primarily on non-EX attackers, it might not be a bad idea to put in a Mewtwo EX to force your opponent to knockout an EX for their final prize of the game. Mewtwo fits in easily with this deck just needing a DCE to use X-Ball. 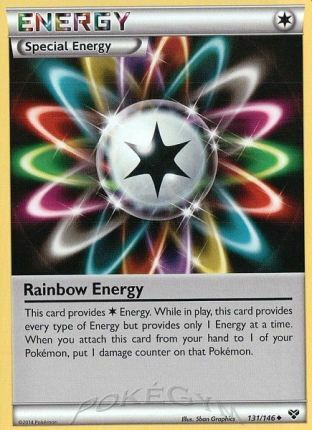 Rainbow Energy – This can lessen the burden of always needing to hitting the right Energy to use a given attack. Because everything is so fragile already, it’s 10 damage drawback is mostly negligible. It opens up some plays like using Heat Tackle with Flareon. I’m not a big fan of it though, as I’ve almost always needed to Super Rod in at least one more Energy to keep my attacks going. Overall, the deck has had very manageable matchups against Plasma, Darkrai EX/Yveltal EX, Virizion EX/Genesect EX, and Fairies. It’s toughest matchups would be against Blastoise and Emboar decks, Emboar more so than Blastoise. Garbodor probably isn’t the greatest option in this deck to counter those decks since most will play Tool Scrappers and you really need to use your tools on your attackers. This is a deck solely focused on spread. It’s easily the deck that can be best relegated to the fun deck category. It definitely can win games, but the inconsistency of a Stage 1 and Stage 2 in the same deck is too much for it to overcome, especially since you want to get multiples of each Pokemon out during a game. Still, it’s a fun deck to mess around with, so I’ll share it anyway. The basic idea of this deck is to spread damage with Gourgeist, and then go after KO’s using Greninja’s either going for what is most conducive to the prize exchange, or just getting rid of a troublesome threat. 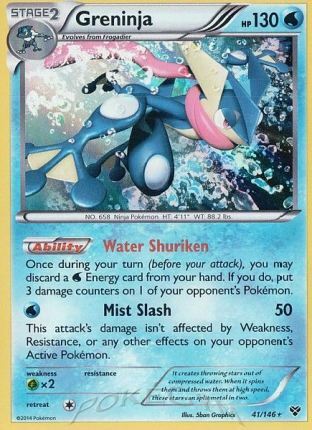 You want to get as many Greninja into play as possible to boast the amount of damage you can do with its Water Shuriken Ability during a turn. This is better than plain Gourgeist spread, as it’s more targeted. However, the spread of Gourgeist early on is very important so that you can start targeting stuff down for KO’s. One great thing you can do with this deck, is not take knockouts with Water Shuriken, but instead just leave a Pokemon with 10-20 HP left, and knock it out with Eerie Voice. I’ve had games where I’ve setup 4 prize turns using that strategy. Two Psychic Energy is pretty low, but with 7 Energy Retrieval cards, once you get the first Psychic out of your deck, you will pretty much have one for the rest of the game. Greninja also has an attack that can be used, that does 50 damage for one Energy. Getting 3 Water Shuriken and that attack off if a great way to knockout a Pokemon when it has previous spread damage to it. Exeggcute is included into the deck as you have 9 cards that make use of discard two cards to be used Items in the deck. Garbodor seems like a bad matchup, but if you just wait to use your Tool Scrapper to target down the Garbodor with Water Shuriken/Eerie Voice, then you can eliminate it from the field for good, just always targeting down any Trubbish. 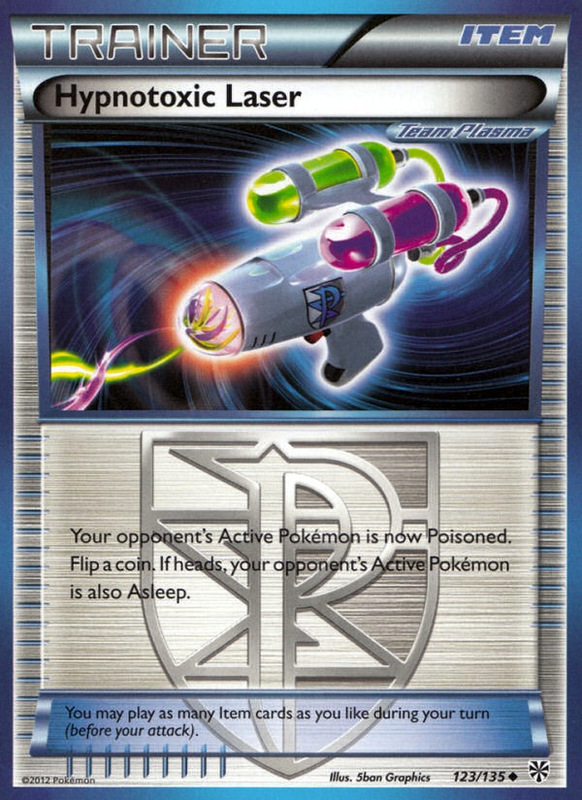 You also have Dowsing Machine available to use a second Tool Scrapper against Garbodor decks. The deck really doesn’t have a good means of beating Lugia based Plasma decks, and its other matchups are all over the place just because of the general inconsistency of the idea. This is a concept that I think most people jumped to over the spread attack when first seeing Gourgeist, and it is a very valid strategy in its own right. The basic idea of the deck is to score OHKO’s using Spirit Scream in conjunction with Hypnotoxic Laser. The main strategy of this deck is to take three OHKO’s on EX’s with Spirit Scream and Hypnotoxic Laser. As this attack costs [P][P] we need a way to stream it, and we use Exp. Share for that. With Masquerain, we can continuously move Exp. Shares to new Gourgeist/Pumpkaboo or even Mewtwo EX to conserve the Energy on our field. Against Virizion EX/Genesect EX, the Spirit Scream strategy doesn’t work fully, so I’ve included a single copy of Chandelure EX which can be used to place those last damage counters for the KO’s. Mewtwo EX is just a generally strong attacker that can fit into any deck that runs DCE. It can be strong in finishing off stuff after spreading with Eerie Voice if you’re unable to get off Spirit Screams continuously because of Tool Scrapper. The one notable tech that I put in this deck is Bronzong NXD. Its Heal Block Ability prevents damage from being healed by either you or your opponent, which shuts off cards like Max Potion or Super Potion from taking off damage you spread. Cassius could be used to get around this, but I don’t expect that to be popular with Max Potion being an Item and still in format. I’ve also included two Silver Mirror, as they’re absolutely essential to give the deck life against Plasma decks and they also help against Virizion EX/Genesect EX decks, and can prevent Darkrai decks from using Absol for easy KO’s. The deck can really beat most of everything, but just like any deck of this type, it will suffer from bouts of inconsistency. The less EX reliant a deck it’s going up against is the more likely it is to struggle. Another approach one could take to this deck is to cut the 1-1 Bronzong line, the 1-1 Masquerain line, Chandelure EX, and the Float Stone for a 2-0-2 Dusknoir line with 2 Rare Candy and manipulate damage that way. I hope this article has served to a lay a good groundwork for people hoping to use Gourgeist in the new format. It’s one of my favorite cards from the new set. I’m not completely sold on it’s power yet, but I think it’s overall a solid card, and a very fun one as well. I’d recommend picking up a playset of these as they’re very cheap at the moment and you never know how the price can be affected with a card like this because someone could get it to click and make a great deck out of it. We’ll have to wait and see how Protect Cube gets printed in English before if we can see how it will fit in with Gourgeist. My initial hunch is that it prevents attack damage, and not all damage, as that’s typically how these cards go. So since Gourgeist places damage counters, I’m not sure if Protect Cube would do that. Additionally, even if it does, Gourgeist’s attack specifies going to a set number (10 HP remaining), so it might not be allowed to be played with Protect Cube as a result. I’d have to see it in action, as at 100 HP, Gourgeist is still kind of fragile. Additionally, space is already tight, so I’m not sure there is any room for Protect Cube. 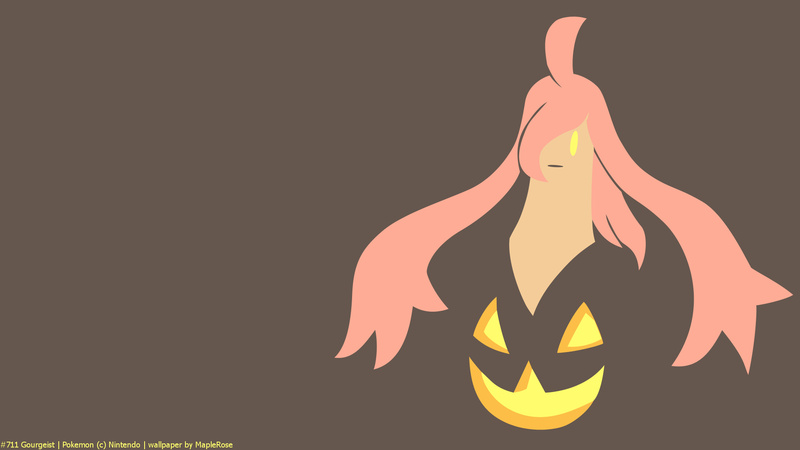 I use sigylipn in my LaserGeist deck as a wall so you can set up pumpkaboo. I also use a garbodor for tough matchups that rely on abilies, such as Genesect-Verizion.. What do you think of my deck list? Please tell me if there is something that can make it better. I use Swellow’s ability to try and pull up certain Pokemon instead of catcher or escape rope. Then Gourgeist + laser. Life dew helps and sometimes dowsing machine could be better. Rocky helmet does wonders too! I really like the Swellow idea. Obviously it doesn’t get everything you want Active, but sometimes, especially as you work the game down, your opponent won’t have a choice of what to send up that won’t punish them. And then the deck definitely has extra bench space to go around. I’ve shied away from Life Dew, just because Tool Scrapper has always been big in my area, but if Tool Scrapper is seeing low play, then it’s definitely really good. Rocky Helmet would be nice too. I’ll be writing about Gourgeist again soon. I played against a really good list/conceptualized model for the deck at the last Regional Championship I attended, and will be writing about that soon. Not only that, even if you don’t get what you want, you can see what they don’t want to lose and figure out their hand. I always bait their scrappers with something else, like a spare helmet or stone, then after they waste it, life dew! And if you have helmets on everything and no htl, and spirit scream, they can’t attack anything without losing something. This deck is amazingly good!